Habit: Subshrub to low shrub, evergreen; generally dioecious. Stem: spreading to decumbent, densely branching. Leaf: alternate or whorled, linear to +- oblong, stiff, strongly rolled under, apparent groove abaxially. Inflorescence: axillary or terminal, flowers 1 or in few-flowered clusters, +- sessile. Flower: unisexual [bisexual], reduced, perianth parts 3--6, +- free, dark purple-red, subtended by scaly bracts. Fruit: drupe, generally juicy. Seed: stones 2--9. Species In Genus: 2--4 species: circumboreal, southern Chile, Tierra del Fuego. Etymology: (Greek: on rocks, from habitat) Note: Wind-pollinated. Stem: generally decumbent, branches 15--40 cm. Leaf: crowded, 3--6 mm, glabrous except along groove. Staminate Flower: stamens (2)3(4). Pistillate Flower: ovary superior, chambers 2--9, style deeply 2--9-lobed. 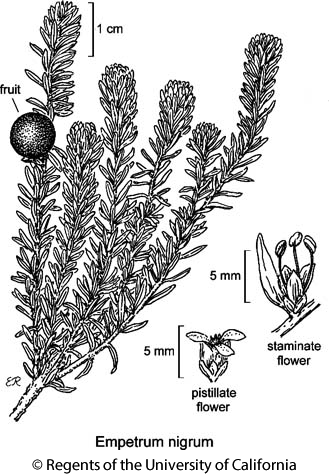 Fruit: 4--6 mm wide, black or purple-black, occasionally red. Ecology: Coastal cliffs on rocks; Elevation: < 200 m. Bioregional Distribution: n NCo (Del Norte, Humboldt cos.); Distribution Outside California: to Alaska; circumboreal. Flowering Time: Apr--May Note: If recognized taxonomically, plants with bisexual flowers assignable to Empetrum nigrum var. hermaphroditum (Hagerup) T.J. Sørensen. Unabridged Note: California populations scattered, small. If recognized taxonomically, plants with bisexual flowers assignable to Empetrum nigrum var. hermaphroditum (Hagerup) T.J. Sørensen. Most California plants seem dioecious. Citation for this treatment: Kathleen A. Kron 2012, Empetrum nigrum, in Jepson Flora Project (eds.) Jepson eFlora, http://ucjeps.berkeley.edu/eflora/eflora_display.php?tid=24229, accessed on April 24, 2019.
n NCo (Del Norte, Humboldt cos.); Markers link to CCH specimen records. Yellow markers indicate records that may provide evidence for eFlora range revision or may have georeferencing or identification issues. Purple markers indicate specimens collected from a garden, greenhouse, or other non-wild location.